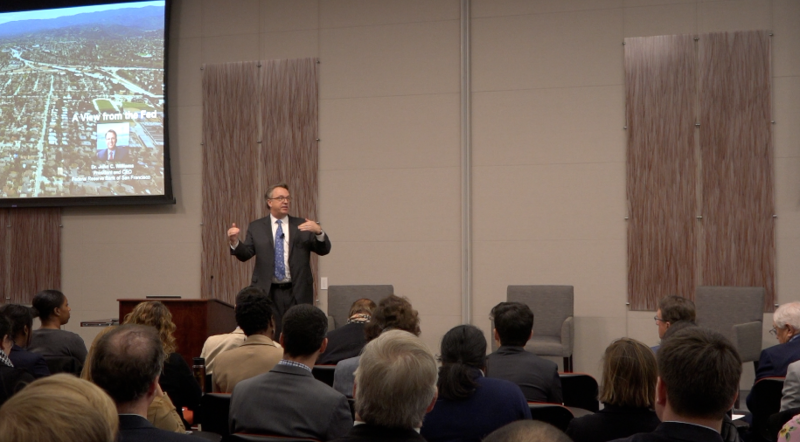 The Bay Area Council Economic Institute held its 11th Annual Economic Forecast on Friday, January 19 at the Federal Reserve Bank of San Francisco. The conference brought together top leaders in the public and private sectors to share their economic outlook for the Bay Area, California, and the nation. Speakers at the Forecast delved into a diverse array of topics, including job growth, commercial real estate trends, workforce education, inclusive economic development, the role of homesharing in the housing market, and visualizing the region’s future. Highlights of the conference were John Williams, President and CEO of the Federal Reserve Bank of San Francisco, sharing his perspective on the economy, and Mayor of Oakland Libby Schaaf announcing new partnerships between businesses and educational initiatives. Kicking off the event, Ranjana Clark of MUFG Union Bank and Kausik Rajgopal of McKinsey & Company spoke about the heavy investments in technology currently being made by businesses across the country. They predicted that automation will play an increasingly large role in the U.S. economy. Colin Yasukochi, Director of Research and Analysis at CBRE, pointed out the tight correlation between job growth, stock prices, and commercial real estate prices, projecting that the cost of office space in the Bay Area will continue to rise in 2018. Igor Popov of Airbnb offered an optimistic view of the future of homesharing, highlighting the flexibility and diversity of housing options that it makes available. O’Brien Chalmers of Steelblue, Radha Mistry of Autodesk, and Aaron Selverston of Owlized participated in a panel discussion about using VR and AR technology to visualize the Bay Area. They spoke about the technology’s potential to increase civic engagement in new development projects. Expressing excitement about the future of Oakland, Mayor Libby Schaaf discussed the success of the Oakland Promise program and the Bay Area Young Men of Color Employment Partnership. She emphasized the importance of inclusive economic growth and, in that vein, announced the new partnership between the Future Designers and Builders Program and Steelblue and Microsoft. Schaaf is joining the Board of the Economic Institute as its new Vice Chair. Finally, John Williams, President and CEO of the Federal Reserve Bank of San Francisco, shared his economic outlook for the Bay Area and the country. He projected that national unemployment will likely continue to drop, drifting down from 4% to about 3.7% in 2018, then remaining at that level for the next couple of years. Inflation is currently at 1.5%, and Williams expects that it will move back up to around 2% over the next two years, which is the Fed’s target rate. With such a strong economy, the Fed aims to gradually raise interest rates back to a more normal level, up from the current short-term rates of about 1.4%.